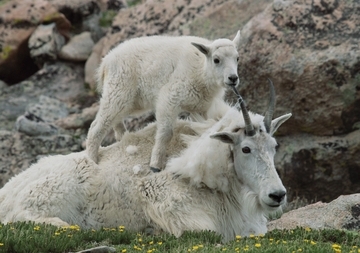 Mountain goats start developing their climbing skills within hours of birth—often by climbing on mom! Thankfully, the nannies are patient with their offspring and spend about a year nurturing them—protecting the little ones from predators and from falls off the steep, rocky mountainsides the goats inhabit. Native only to the high alpine regions of northwestern North America, from Alaska to the Colorado Rockies, the mountain goat (Oreamnos americanus) has hooves well adapted for climbing and a thick coat to ward off frigid winter winds. It’s also a great jumper, able to span more than ten feet in a single bound.